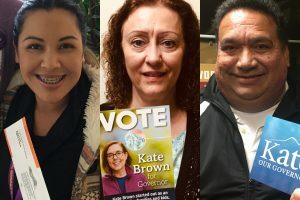 On November 6, Oregonians re-elected Governor Kate Brown and sent pro-worker majorities to the state legislature. Governor Brown’s commitment to good union jobs, affordable healthcare, and stable housing inspired SEIU members to take action. Together, our union knocked on 85,000 doors, made 11,000 calls, sent 70,000 texts and helped win an election that will make our union even stronger! Affordable healthcare: Governor Brown expanded access to medical care and ensured funding for Oregonians on Medicaid, and will continue pushing back against attacks on our access to healthcare. Wages: Governor Brown believes workers shouldn’t have to struggle to survive. She raised Oregon’s minimum wage, and has pledged to stand with SEIU members who are fighting to improve their wages to keep up with the cost of living. 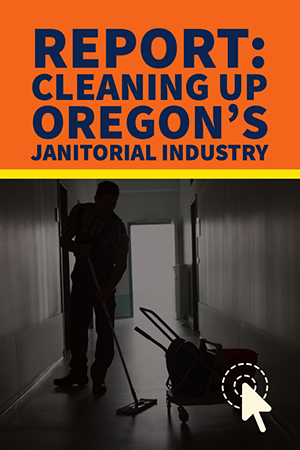 Safe workplaces: Governor Brown passed a law that protects janitors from wage theft and sexual assault in the workplace, and we can trust her to continue supporting policies that protect workers. In Oregon, we also defeated two ballot measures that would have harmed many SEIU members: Measure 105, which would have repealed our state’s anti-racial profiling law; and Measure 106, which would have cut access to reproductive care for women on Medicaid. Voters in Southwest Washington won an incredible victory that will improve law enforcement and save lives. By passing Initiative 940, we will ensure police officers will receive the training they need to safely de-escalate mental health crisis situations, which will save lives and build trust in our communities. SEIU members worked hard knocking on doors and talking to voters to elect pro-worker candidates in the districts where we live and work. Results from yesterday’s election show that Washingtonians remain committed to our values: affordable healthcare, good union jobs, and keeping our communities safe. Politics are extremely important to the lives of SEIU members and our families. In the legislature and at the bargaining table, we will continue to fight to improve members’ lives. Our union is committed to electing lawmakers who will stand with us as we work to win better wages and standards at our worksites, and fight to build an economy that works for all of us—not just the wealthy few.